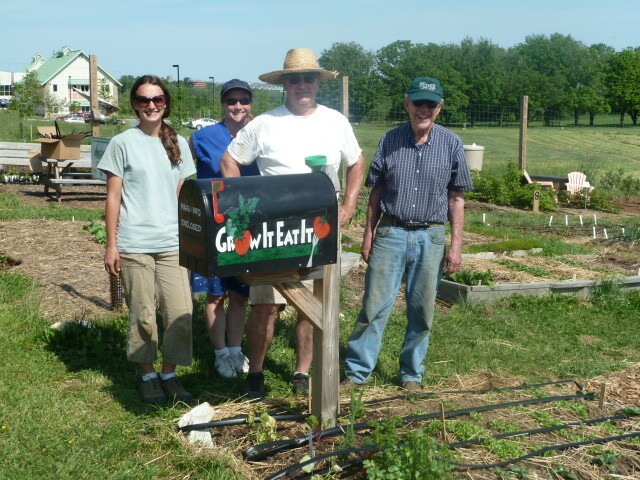 On Friday, a large group of volunteers installed two drip irrigation zones at the Baltimore County demonstration garden. The perennial zone (540 square feet of asparagus, raspberries and blueberries) used a drip tube system where half inch drip tube (with pre-installed half gallon per hour pressure compensating emitters spaced every 12 inches) was installed on either side of the row. One inch of water can be delivered to this zone in two and a half hours. The second zone contained numerous raised beds (mostly 4 x 10 feet) which will be irrigated using drip tape. The irrigation team laid 380 feet of one inch lay flat tube which is the feeder tube for the drip tape. Tube to tape fittings were punched into the tube and drip tape was attached. This zone was 800 square feet and can be watered in two hours. http://extension.umd.edu/mg/giei-powerpoint-presentations and clicking on MG6 DripIr.Phillips. Shown in the picture are Tiffany, Debby, myself and Paul, who were some of the volunteers installing the system at the demonstration garden.